Select the Product Bundle type in the Product Data panel. Go to the Bundled Products tab. 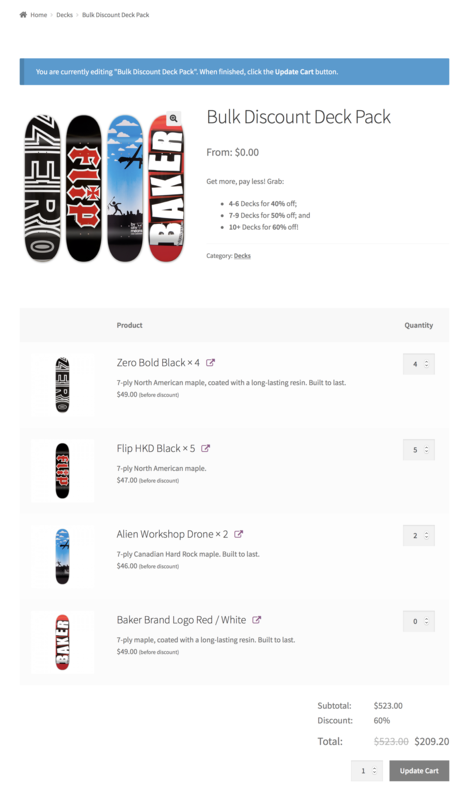 Click Add Product and use the search field to find and add products to the bundle. Repeat as many times as needed, each time clicking on a search result to add it. Product Bundles supports simple products, variable products and simple/variable subscriptions. Grouped and external products are not supported and cannot be bundled. 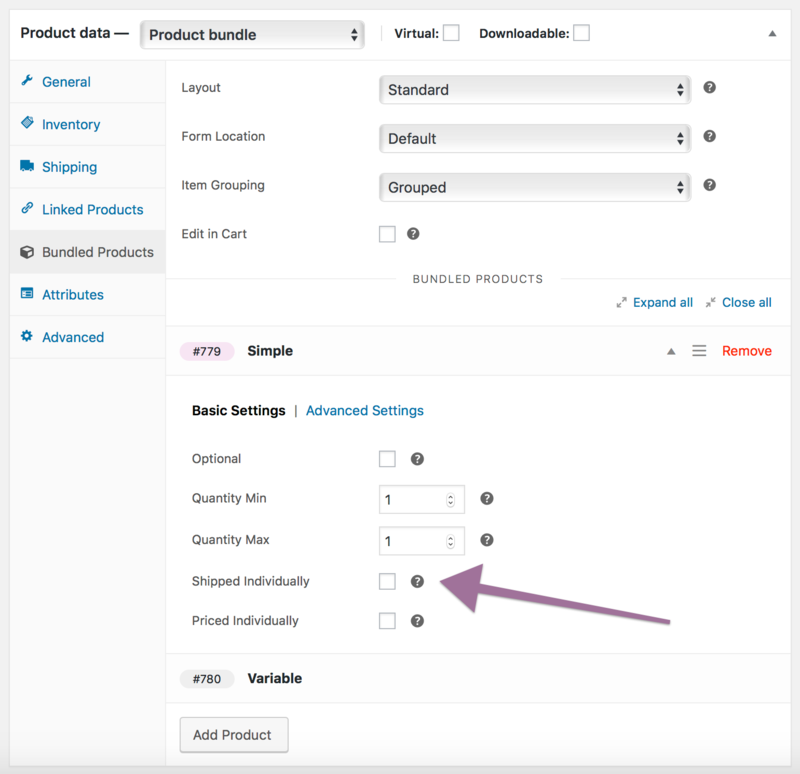 Product bundles cannot be bundled and will not work correctly when added to Grouped products. 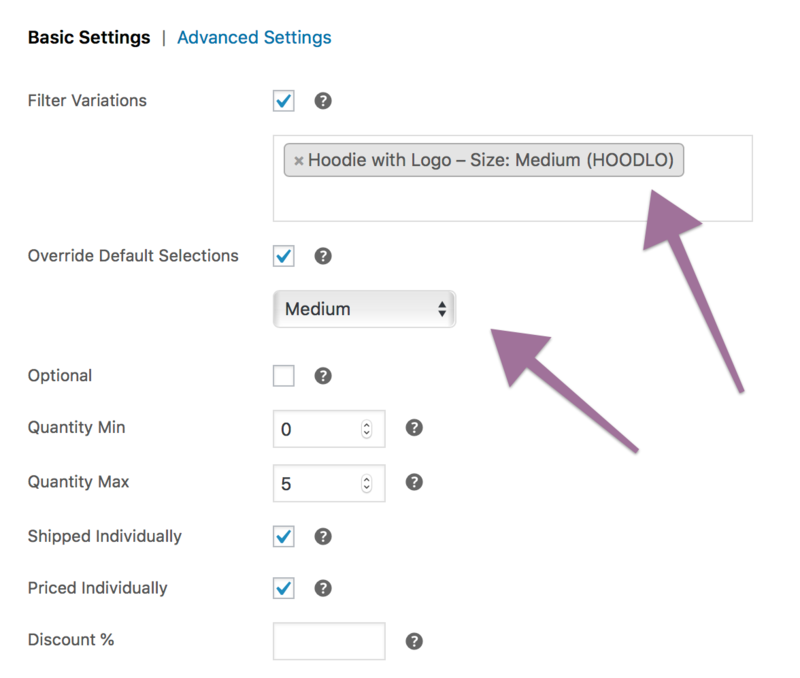 Each time you add a product, a new set of bundled product options becomes available. These options allow you to change parameters specific to the added item, such as pricing & shipping options, minimum and maximum quantities and more. Note that it’s possible to bundle multiple instances of the same simple or variable product together and configure each one individually. This creates many possibilities — for example, you can bundle together individual variations of a single variable product. The Bundle type can be used in a wide range of bundling/kitting applications with diverse pricing requirements, as it allows you to define a static base price for the entire bundle, and/or to add the individual price of each bundled product to this base price. 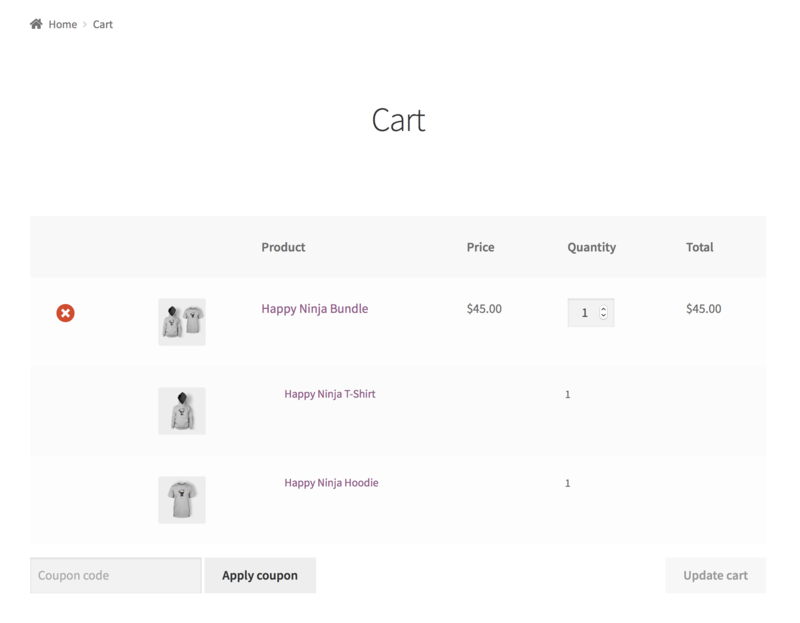 In the cart, a bundle is displayed as a parent line item – named after the product bundle itself – followed by a child line item for each bundled product. Child/bundled items are grouped by their parent/container item and bundled product quantities are kept in sync with the quantity of their parent. This approach makes it possible to define a static base price for the entire bundle, and/or to add the individual prices of bundled products to this base price. 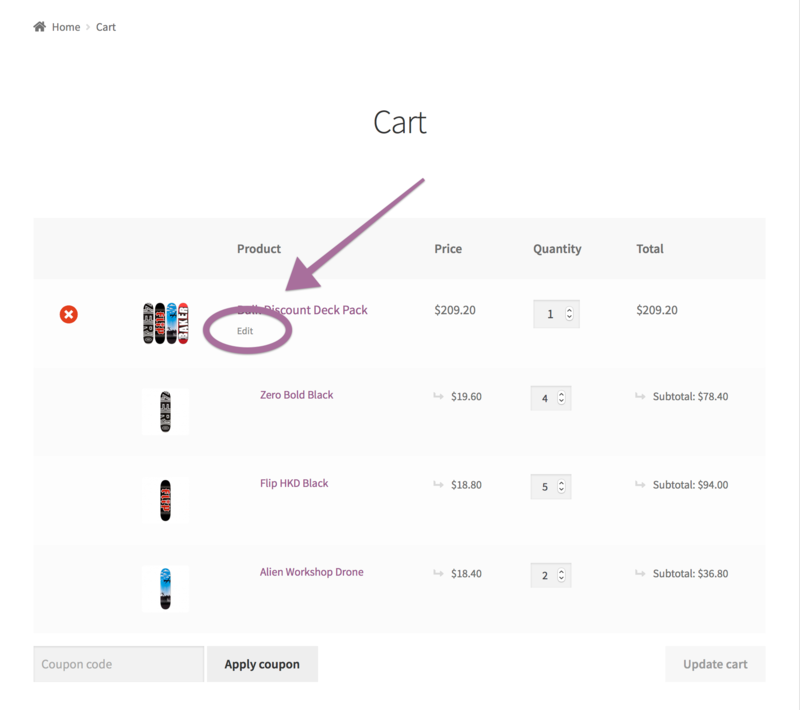 Note: In some use cases, displaying a parent item in cart/order templates might not be ideal, for example when offering unassembled bundles of individually-priced products. If you need Product Bundles to behave and look more similar to Grouped Products in cart/order templates, choose None under Bundled Products > Item Grouping. Read more about the Item Grouping option here. Go to Products > All Products and select the bundle you wish to edit. Enter a Regular Price and, if needed, a Sale Price. Note that if you only use these fields to define the price of a bundle, its contents/configuration have no effect on its price. Despite its limitations, this simple pricing configuration is sufficient in many cases, and is recommended for quickly creating pre-built kits. 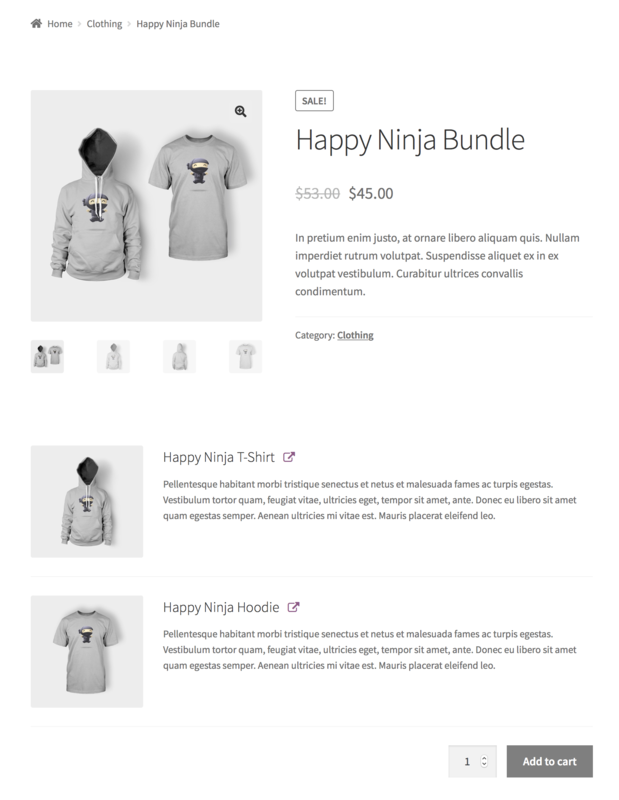 The Happy Ninja bundle – in the cart. Configuring the Happy Ninja bundle. Assigning a static price to the bundle. Changes to the Regular/Sale Price of a bundle only affect the subtotal of its parent cart/order line item. When using this method to set the price of an entire bundle, the order item subtotals of all bundled products included in it are zero — as a result, their earnings reporting accuracy will be gradually compromised. If reporting accuracy is important to you, avoid static bundle prices and only use them if a bundle is a service, process or physical item with a “base value” of its own. In some cases, using a static bundle price might not be possible due to Tax Law requirements. When creating a bundle of products that have different tax rates, be aware that a static bundle price limits you to a single tax rate. When creating bundles that include configurable items (variable products, optional products or products with configurable quantities) a common requirement is to total the individual prices of some/all bundled items. This is possible by enabling the Priced Individually option, located under the Basic Settings tab of every bundled item. 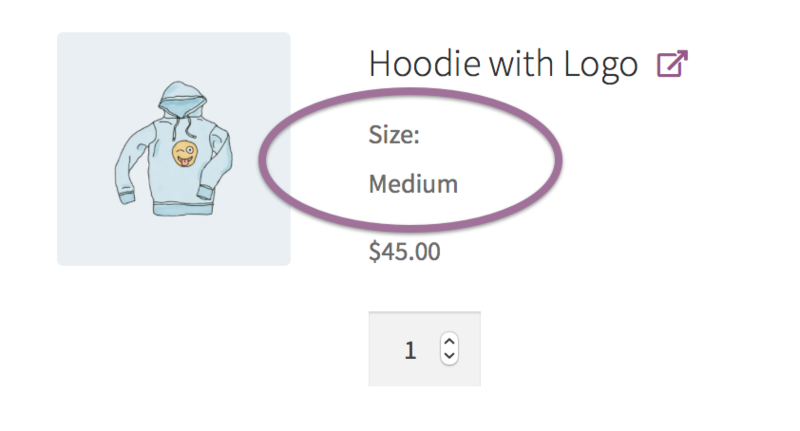 Priced Individually usually needs to be checked if the quantity of a bundled item is configurable — this is common when selling items in bulk. The Bulk Discount Deck Pack bundle. The Bulk Discount Deck Pack bundle – in the cart. Configuring the Bulk Discount Deck Pack bundle. Note that when Priced Individually is checked, it is possible to define a % Discount for the bundled product. This is applied to its regular price by default. Discounts provide an incentive for purchasing items in bulk and/or purchasing optional “add-ons”, such as accessories. In cases similar to the Bulk Discount Deck Pack bundle, it may be necessary to leave the bundle price fields empty. This is fine as long as at least one bundled product is Priced Individually. Note that sometimes it is desirable to use the bundle price fields to define a base bundle price, and at the same time enable the Priced Individually option of one or more bundled items. When Priced Individually is enabled, the bundled product price is visible in i) the product details page of the bundle, ii) the cart and iii) order details by default. To change this behavior, use the Price Visibility options found in the Advanced Settings tab. When the Grouped selection is active under Item Grouping, the subtotals of parent/child line items in cart/order templates are added together and the actual subtotal of the parent item is replaced by the aggregated subtotal. Additionally, the subtotals of individually-priced items are indented and displayed with a Subtotal: prefix. This behavior can be changed with this snippet. When a Subscription product is added to a bundle, the Subscription product must be Priced Individually if you want a subscription to be set up. Otherwise, the Subscription product will be treated as a Simple product and granted to the customer once. Woo Tech is an awesome company using WooCommerce to sell computers online. Its entry-level desktop PC, Woo Basic, is assembled from a list of inventory-managed components. Some of these components are listed in the Woo Tech catalog, and some are unlisted OEM parts. Once a Woo Basic PC is assembled, the original packaging of the assembled components is discarded, and the PC is packaged and shipped in one box along with all product manuals and accompanying material. Assembled bundles have their own physical properties which replace the physical properties of their components. Unassembled bundles are physically identical to the sum of their components. The extension supports both types of bundles. It even allows you to create partially assembled bundles by individually selecting those bundled items that require assembly. the bundle groups together some physical products that don’t require assembly. Leave the Virtual box unchecked if the bundle contains physical products that need to be assembled or packaged together and shipped in a new container. If you determined that the bundle is not Virtual in Step 1, configure its physical/shipping properties by navigating to the Shipping tab in the left menu. If the bundle contains assembled components, use the Shipping tab options to define the physical/shipping properties of the entire assembly. If the bundle consists of virtual items only, no further action is needed. enabled for each item that doesn’t. Remember that if a bundled item is not assembled or physically packaged in the bundle, then it needs to be Shipped Individually. By default, assembled bundles have a static weight, which is defined under Product Data > Shipping > Weight. Assembled bundled items (Shipped Individually is disabled) have no effect on the weight of their container. If you prefer to use the value entered in the Weight field as a base container weight, and let each assembled bundled item contribute its own weight to it, use this snippet. Offering additional, closely related products above the add-to-cart button. Bundling some mandatory items with products that require them. In such cases, the Product Data > Virtual and Product Data > Shipping settings of the base product don’t need to be modified when changing its product type from Simple to Product bundle. The shipping configuration options of the Bundle type allow shipping methods and other business logic that relies on the WooCommerce Shipping API to calculate shipping costs accurately. External fulfillment, shipping and inventory management services work by importing WooCommerce order data. If you rely on an external service provider, you might encounter issues with assembled bundles (this means Shipped Individually is disabled for one or more bundled products). For example, you may find that the physical properties of imported bundles are inaccurate, resulting in wrong shipping rate calculations — or that bundled product SKUs are not imported at all, resulting in inventory issues. Product Bundles provides an API that allows you to restore the physical representation of your bundles when reading order data, and possibly generate custom bundle/kit SKUs for bundles that contain assembled items. Note that if your catalog only includes pre-built bundles with static contents and you are using an external service for inventory management, it might be preferable to use a core WooCommerce product type to build your bundles and let the external system work out its “component SKUs” by breaking up its bundle/kit SKU. We are unable to provide assistance with customizations/integrations under our Support Policy. 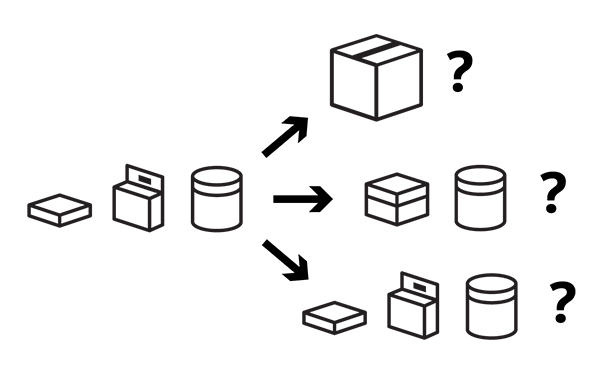 For WordPress/WooCommerce customizations and custom integrations, we highly recommend Codeable, or a Certified WooExpert. 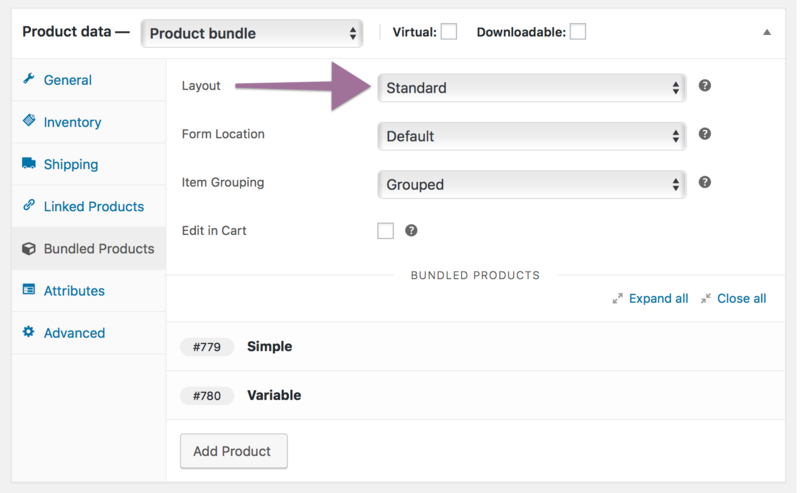 Once a product has been added to a bundle, a new set of options becomes available for the newly added item. These are divided in two tabs: Basic Settings and Advanced Settings. Minimum Quantity and Maximum Quantity — Used to define an allowed quantity range for the bundled product: Customers are able to choose any quantity within the specified min/max range. Leave the Quantity Max field blank for an unlimited maximum value. 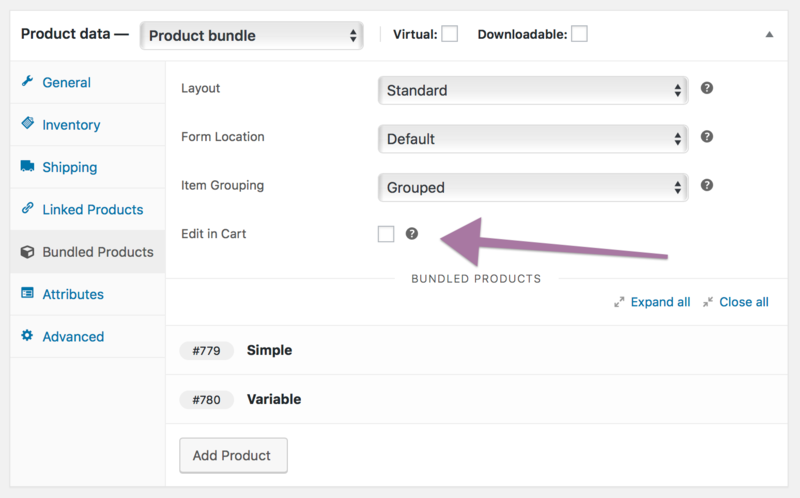 Optional — When enabled, customers may choose whether to include the bundled product in their bundle or not. Filter Variations — Makes it possible to make specific variations available for purchase. Applicable to variable products only. Override Default Selections — Used for overriding the pre-selected attribute values of bundled variable products. Enable Filter Variations and search for a variation, then add it. Enable Override Default Selections and choose specific values for all variation attributes. This step is necessary if you want to hide the attribute selection drop-downs of this bundled product — even if the active variation is already mapped to specific attribute values. Adding a single variation to a Bundle. Priced Individually — Adds the price of the bundled product to the base bundle price. With the option enabled, a Discount can be defined. Both options are documented in the Pricing section. Shipped Individually — Controls how the bundled product is shipped in relation to the entire bundle (assembled or unassembled). Documented in the Shipping section. 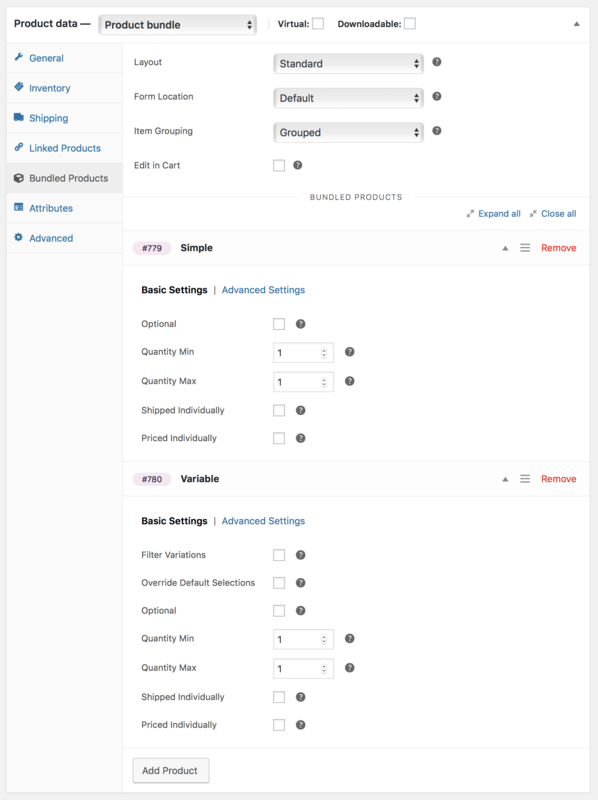 Visibility — Controls the visibility of the bundled product: i) in the single product page of the bundle, ii) in the cart/checkout pages, and iii) when displaying order details (including order details displayed in e-mail notifications). Marking a bundled product as hidden in the order/e-mail templates will not prevent payment gateways from listing it in their transaction details archives and customer notification e-mails. Price Visibility — Controls the visibility of the bundled product price: i) in the product details page of the bundle, ii) in the cart and iii) when displaying order details. Applicable when Priced Individually is ticked. Override Title and Override Short Description — Used for modifying or hiding the original titles and/or short descriptions of bundled products. Note that overridden product titles will replace the original product titles in all template locations, including the cart/checkout and order details. Hide Thumbnail — Controls the visibility of bundled product thumbnails, displayed by default when viewing the single-product details page of a bundle. 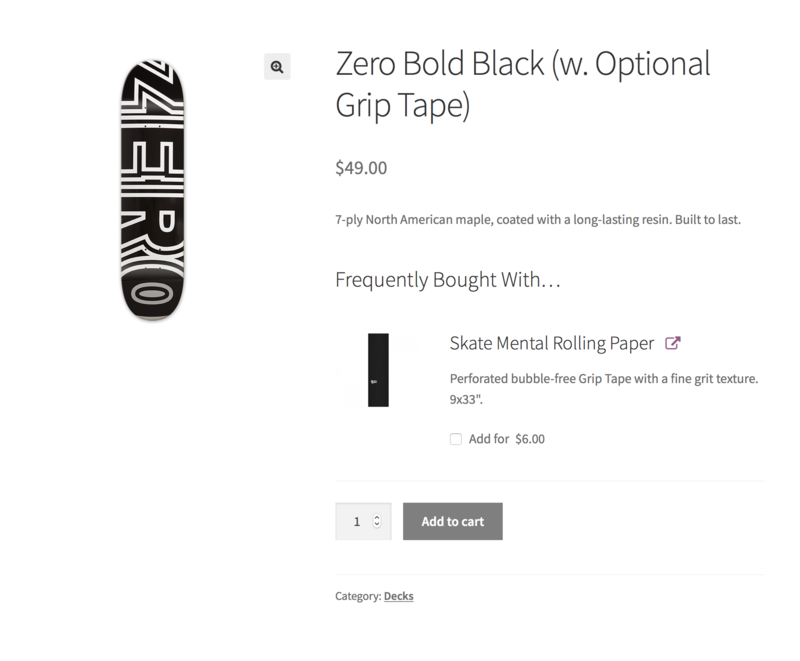 The Layout option controls the appearance of bundled product details in single-product pages. There are 3 alternatives to choose from: Standard, Tabular and Grid. The Tabular option is recommended for bundles that contain multiple bundled products with configurable quantities as it makes viewing/comparing item quantities easier. Choosing a Bulk Discount Deck Pack bundle layout: Standard (left) vs Tabular (center) vs Grid (right). Navigate to Product Data > Bundled Products. In most cases, choosing After Summary will allocate the entire page width to the form contents of your Bundle. 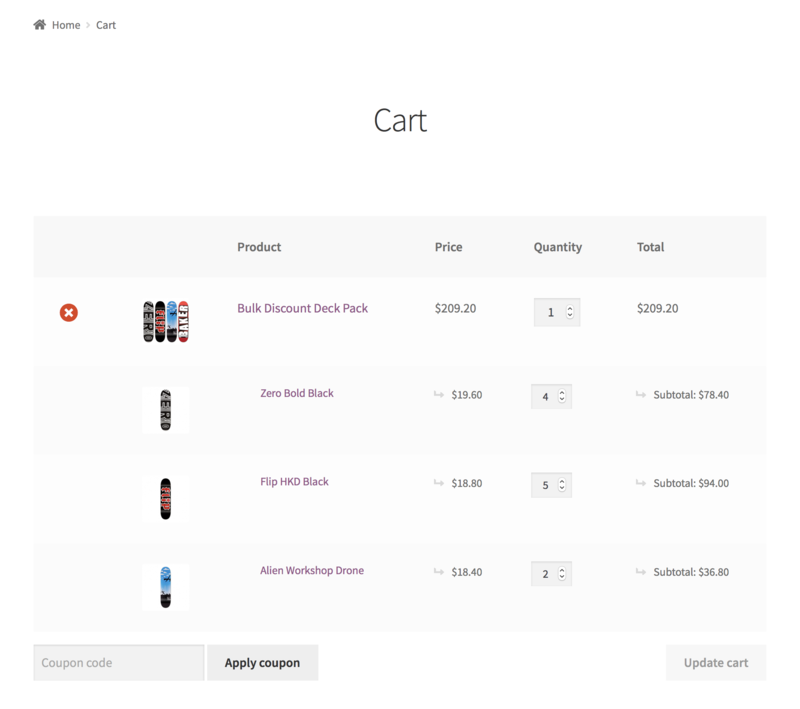 Grouped — Bundled items in cart/order templates are grouped under a parent line item named after the product bundle itself. Bundled items are indented and bundled item quantities are kept in sync with the quantity of their parent. Must be selected when creating assembled bundles and/or bundles with a static/base price component. When the Grouped option is active, the subtotals of parent/child line items in cart/order templates are added together and the actual subtotal of the parent item is replaced by the aggregated subtotal. Additionally, the subtotals of individually-priced items are indented and displayed with a Subtotal: prefix. This behavior can be changed with this snippet. Flat — Similar to Grouped, however instead of being indented, bundled cart/order items include a reference to the bundle they belong to. 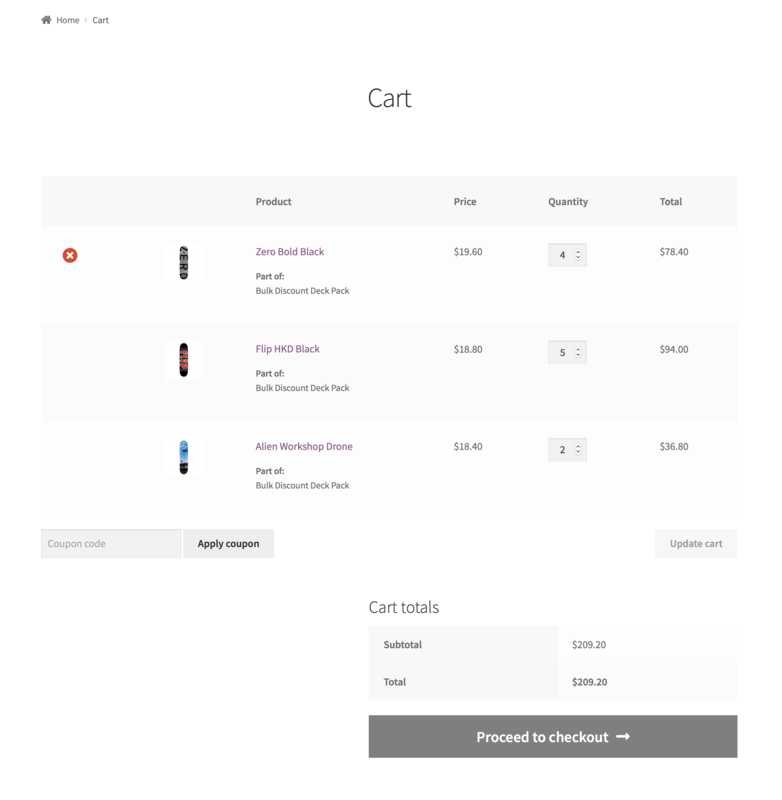 None — Hides the parent item in all cart/order templates. Bundled cart/order items include a reference to the bundle they belong to. Makes Bundles resemble Grouped Products in all customer-facing templates. Virtual needs to be checked. Shipped Individually needs to be enabled for all bundled products. The Regular/Sale Price fields must be blank. When None is active, a bundle can be purchased only if at least one bundled item is included or selected. Item Grouping: Grouped (left) vs None (right). Configurable bundles, such as the Bulk Discount Deck Pack bundle, can be edited from the cart page by enabling the Edit in Cart option. The Edit in Cart checkbox. When Edit in Cart is enabled for the Bulk Discount Deck Pack bundle, an additional “Edit” link is appended to its title in the cart. Following this link allows you to reconfigure the bundle using its current configuration as a starting point. 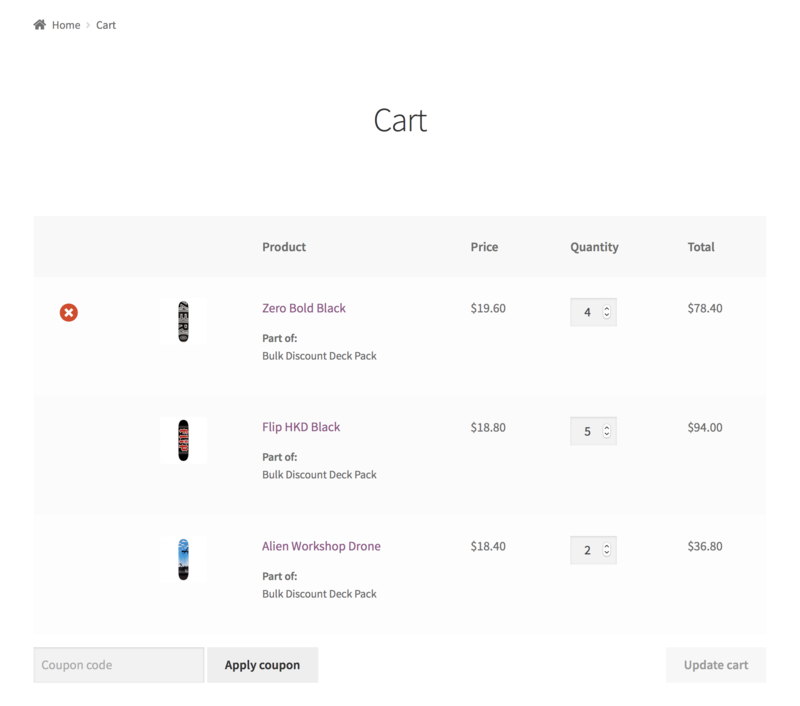 When finished, click Update Cart to replace the configuration in your cart with the new one. Editing a bundle from the cart page. You have probably seen bundle-sells before: Much like a cross-sell, a bundle-sell is an offer to purchase a helpful add-on along with the currently viewed product. 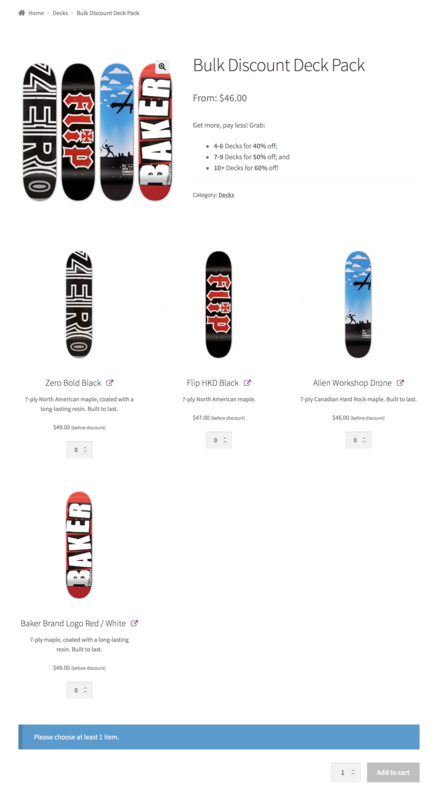 Grip tape — an ideal bundle-sell with new skateboard decks! Go to the Products admin page. Edit a product that you consider a good candidate for offering bundle-sells. 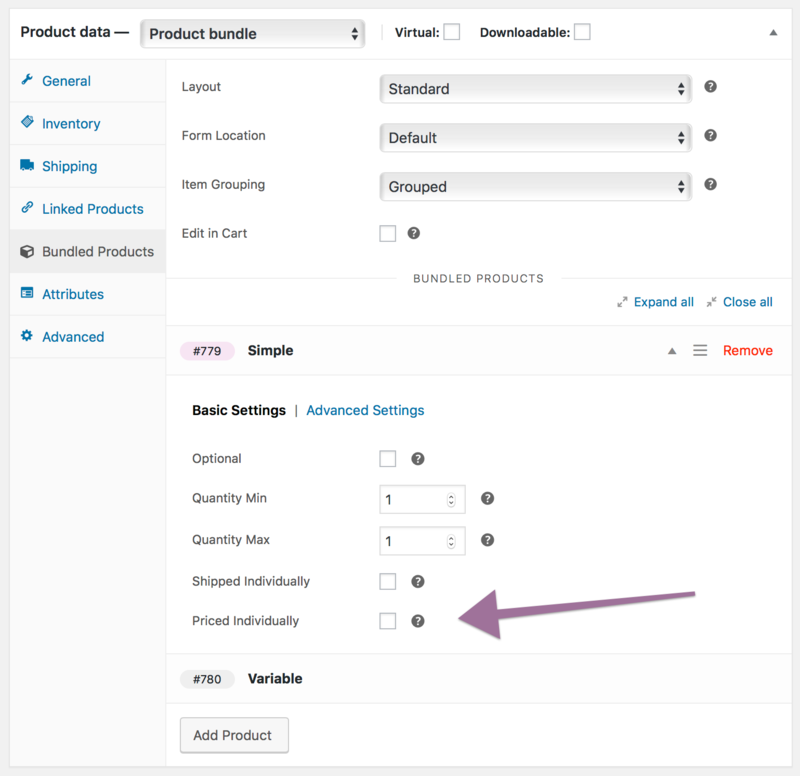 Go to Product Data > Linked Products and locate the Bundle-sells field. Search for an optional product to recommend and add it. Enter a Bundle-sells title below, e.g. “Frequently Bought With…”. Only Simple and Subscription products can be offered as Bundle-sells. Convert the Simple product to a Product Bundle. Go to Product Data > Bundled Products. Tick the Optional, Priced Individually and Shipped Individually boxes. The sale of a product in a bundle has the same effect on its stock as an individual sale. If the stock quantity of a bundled product drops below the minimum quantity specified in the bundle, then the bundle appears with an Insufficient Stock status and cannot be purchased. A product appearing as In stock in your catalog may not have enough stock to cover the requirements of every bundle that contains it. For example, if the Minimum Quantity defined for a bundled product in one or more bundles is higher than its remaining stock, then these bundles will not be available for purchase. 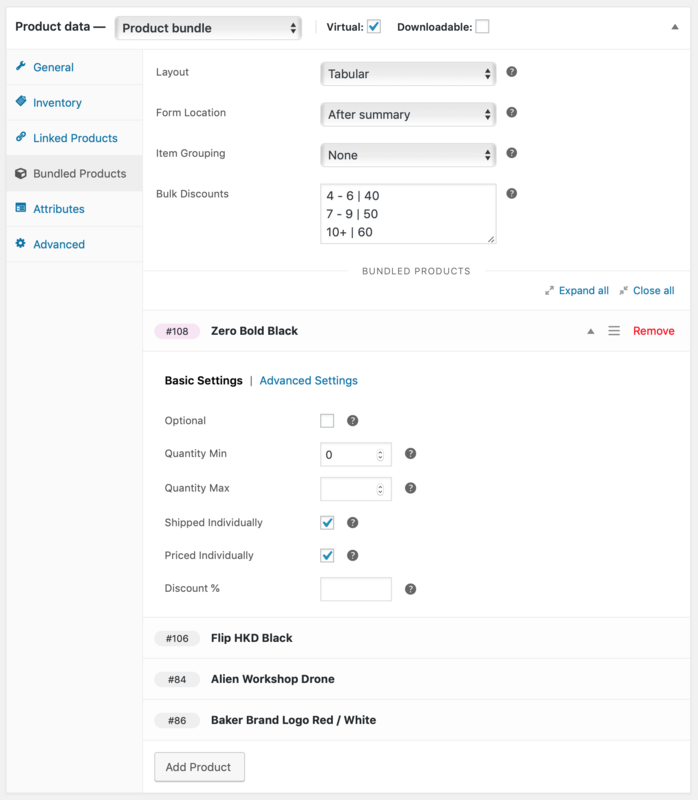 To monitor bundled product stock, navigate to WooCommerce > Reports > Stock > Insufficient stock. This report gives you an overview of all products you have added in Bundles that fail to satisfy the stock/quantity requirements of their container. With Product Bundles, it’s possible to define bundle SKUs and manage inventory for bundle SKUs. The ability to set stock quantities for bundle SKUs allows you to place constraints on the bundling process itself, e.g., associated with time, manpower or another limited resource. 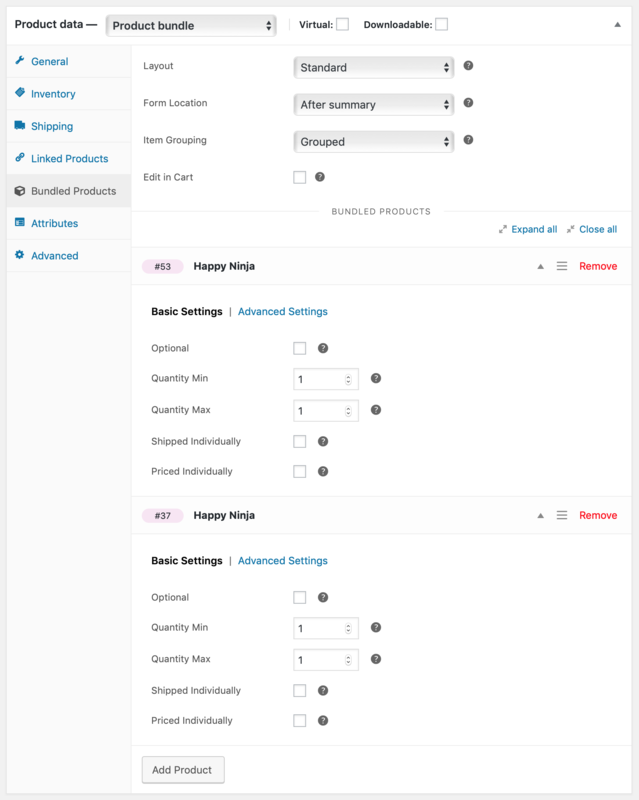 Go to the Inventory settings tab of a bundle to enable stock management and set bundle-level stock quantities. Note that when stock management at bundle level is enabled, the inventory of bundled products is not overridden or affected in any way. Bundle SKUs are static by default. If you plan to use the extension with an external order fulfillment, shipping or inventory management service and need a way to generate dynamic bundle SKUs, please refer to the Shipping section for details. Note that if your catalog only includes pre-built bundles with static contents and you are using an external service for inventory management, it might be preferable to use a core WooCommerce product type to build your bundles and let the external system work out its “component SKUs” by breaking up its bundle/kit SKU. Creating Simple Product Kits – The Happy Ninja bundle. Creating Pick and Mix Bundles – The 4/40 Deck Pack bundle. Selling Products in Bulk – The Bulk Discount Deck Pack bundle. Creating Downloadable Item Packages – The Woo Music bundle. 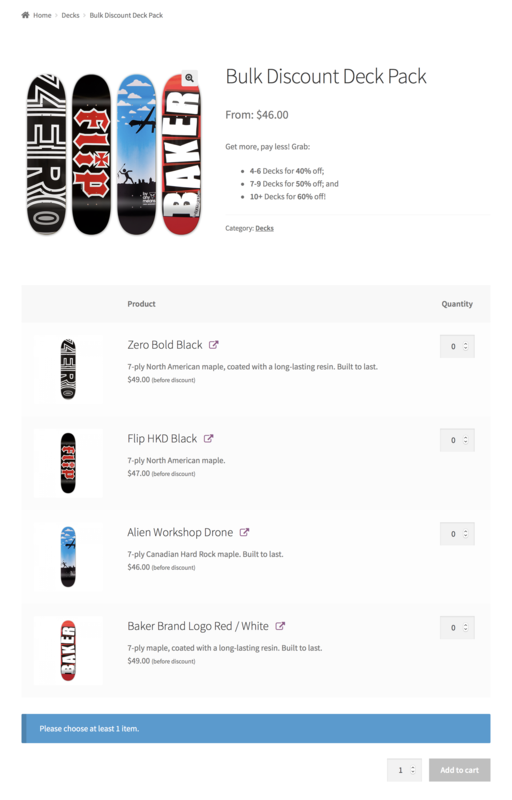 Creating Assembled Products – The Complete Skateboard scenario. 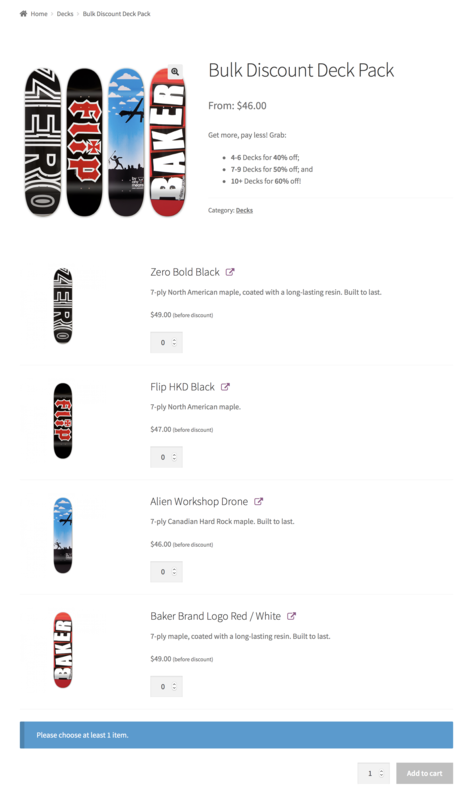 Offering Up-Sells – The Skateboard Decks scenario. Offering Bundle-Sells – Add Frequently Bought Together recommendations to any product.